Transferring e-Commerce data from CSV (XML, etc.) files to a platform appears risky and complicated, especially to non-technical merchants. Despite a plethora of educational materials on the Internet - detailed textual and video tutorials, lots of store owners still import CSV to Magento improperly. What happens? Some of their data gets lost along the way, some - duplicated and some appears in the wrong fields. The main reason for such issues lies in discrepancies between the formats in which one cart gives out Comma Separated Value files (for downloads), and other receives them (by uploads). Thus, the trivial task to import product CSV to Magento becomes challenging. Theoretically, exporting data to CSV and uploading it to a shopping cart is a piece of cake, but in reality, it isn’t nearly as simple. Today, we’ll try to describe how to import product CSV to Magento, mention the bottlenecks of this procedure, and tips for making it as fast and convenient as possible. But first, let`s discover the following question. It`s not a secret that Magento is considered to be one of the most powerful feature-packed eCommerce solution that continually wins the hearts of thousands of merchants. This is for good reason, of course. According to Built With stats, there are 523,385 websites using this eCommerce engine. It should have something awesome to gather such a big number of merchants, do you agree? Thus, we`ll be precise and name the most incredible things you`ll love in Magento. Magento 2 developers did a great job to ensure to its clients the best shopping experience through fast page loading. 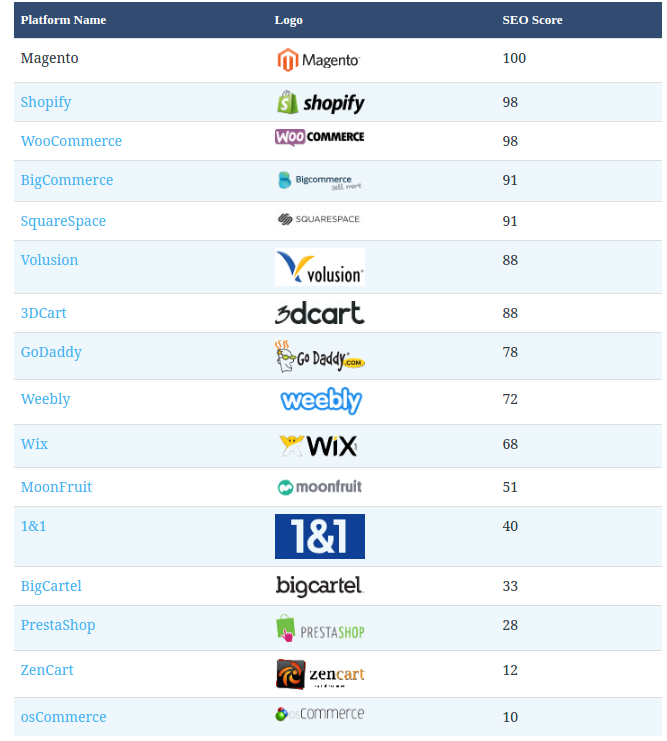 According to Ecommerce Platforms Comparative Speed Testing, Magento is a runner-up after Shopify. What`s more, thanks to Magento powerful coding techniques and advanced design, it handles 117% more orders and secures 2.1 million more page views in comparison to Magento 1x. To start with, it`s worth mentioning that according to eCommerce platforms research, Magento is a number one in offering the most comprehensive SEO features. It has 100 out of 100 scores and undoubtedly this is amazing results. It`s one of eCommerce solutions that offers a big number of SEO features right out of the box. I mean home pages meta tags, product images optimization, categories and products canonical tags etc. Apart from it, we won't be mistaken saying that Magento is perhaps one of the most vivid representative of impressive variety of SEO apps. All of them you can find in its extensive marketplace. Magento offers the widest range of templates to give your store a super professional look. At the moment there are 121 totally costless themes in Magento extension store. The paid ones also won't burn a hole in your budget as their prices start from extensions $0,01. Thanks to Magento extensive developer community, any tech problem can be solved in an instant. With Magento, you gain access to global forum where all questions are already answered. What's more, those who run their online store with Magento Enterprise Edition may rely on dedicated tech support that tweak your business to a new level. For sure, these are not all Magento strengths, however, even those mentioned above show that Magento migration is a way to go! How to import products to Magento? Download our template file that’s structured by Magento’s standards. Adjust your current product file accordingly. Optionally, you can import CSV files to a test store first, to ensure that the previous steps were done properly and everything works correctly. That way, you’ll keep your actual online retailer out of risk keeping it available for customers and untouched until everything is setup correctly. Taking into account that manul products import is very complicated, time-consuming and requires a high level of tech expertise, it`s better to use automatic way to add all products to your new Magento online store. Luckily, there is a great variety of options to choose from. However, you have to be 100% sure about its quality which is often questionable. Choose the apps only from reliable sources that will prevent you from incorrect data transfer. What's more, if you use little-known modules or scripts, you`ll unlikely get any kind of tech support in case any “emergencies” issues arise. As a result, you`ll have to solve the problems by your own or hire a developer that in its turn makes all your money-saving attempts a total failure. So, what is a trustworthy solution for a secure Magento CSV product import? Now we`re ready to see how it works in action! Ready? Let`s get started. Set up your Source Cart. Choose CSV File as Source Cart : additionally, you can provide the URL of the store from which the file was exported - that would enable the migration of product images. Otherwise, type in any URL. Set up your Target Cart. 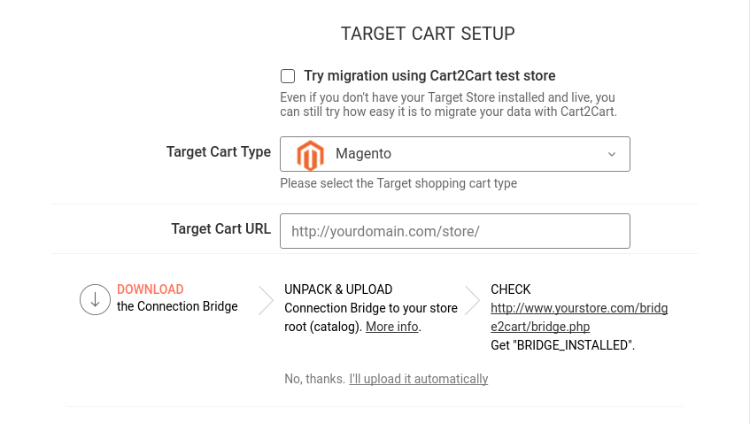 Select Magento as Target Cart, paste its URL, and upload Cart2Cart’s Connection Bridge to your store’s root directory via FTP - you’ll be given detailed instructions on how to do that. Pick up the entities you’d like to move and additional options if needed. Upload your CSV file and the file with product attributes, if you want to migrate them as well. 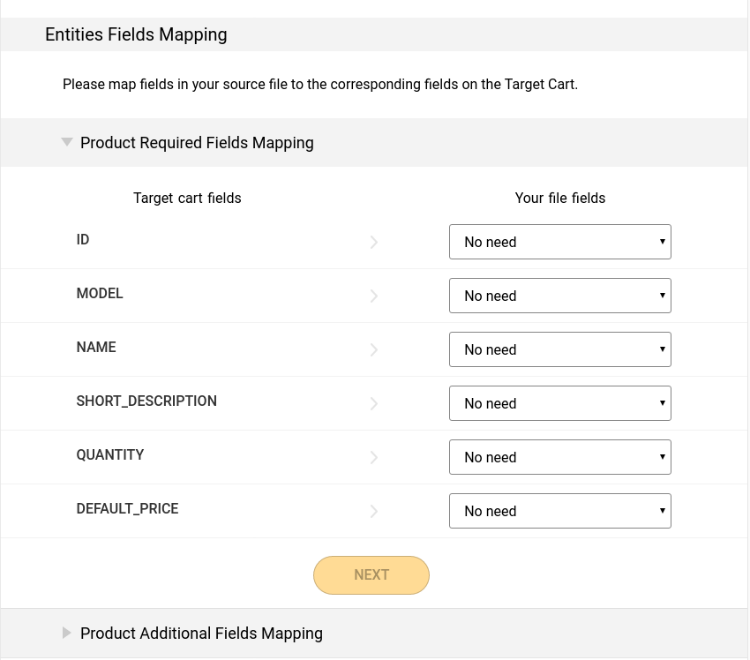 Map the fields in your CSV file with the corresponding ones on Magento. Now, start a Free Demo migration that allows to perform a test import in just up to 30 minutes. 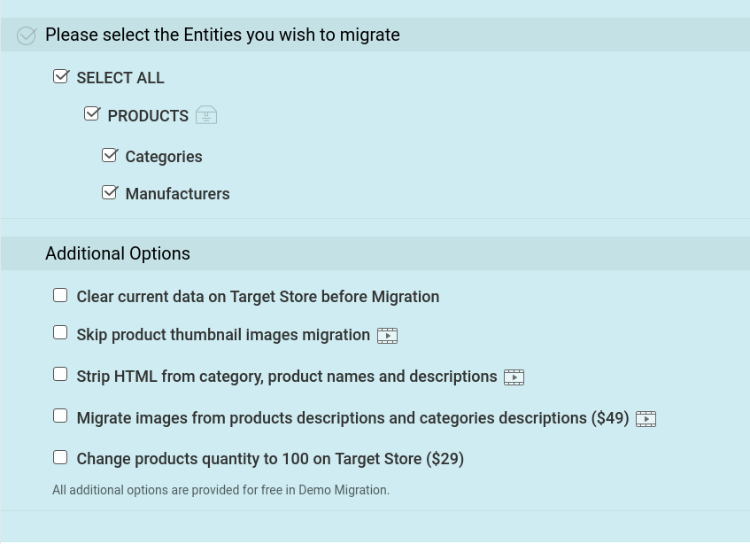 If you`re satisfied with results, launch a Full Demo migration and get the most comprehensive Magento product import ASAP. 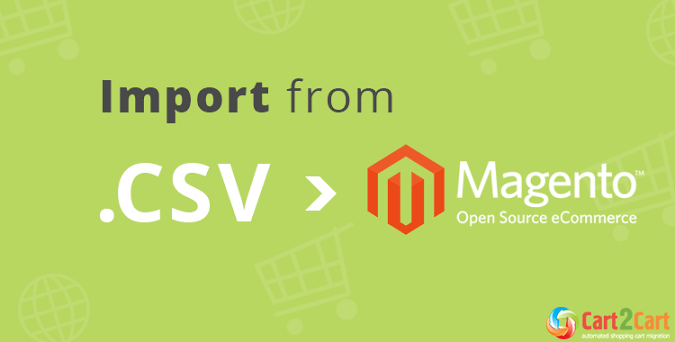 Magento CSV product Import 101 - what if something went wrong? If you’ve spotted that some images are missing (evidently most common problem for store owners) - run through your mapping again, check if image fields are valid and their full URLs are in place. Ensure that file’s permissions are “777”. If you see invalid paths and SKUs not defined - usually the problem lies in wrong characters in CSV file. Have another look at your description section. Some products are duplicated? The most likely reason is mismatched SKUs -- look if all the SKU fields are mapped properly with the corresponding ones on Magento. That’s pretty much all to know how to import products to Magento - now, nothing else separates you from running a functionally advanced online retailer. Stop hesitating, start a Free Demo migration and enjoy the easiness of the switch procedure! Cart2Cart wishes you luck with your online business!